Premium sector car owners invariably have a second string vehicle, be it at their home or at a second home where it has to be sensibly sized and practical, so this month I have purposely down-sized and concentrated on an interesting car product from the Fiat Group. Obviously when it comes to Fiat car products I would expect the major concentration at the current time would be on the Fiat 500 range, notably the latest and largest 500L version but a week’s test with the latest Punto 3-door hatch back proved that it is a seriously competent contender in a strongly contested market. It is a category where size matters in that the overall dimensions are convenient for crowded town situations yet the interior space is comfortable for five adult sized occupants and it has practical load carrying potential. In essence a car product primarily designed and developed for economical motoring where there is always a strong demand but that does not rule out some niche market versions offering sportier performance and a more trendy image. 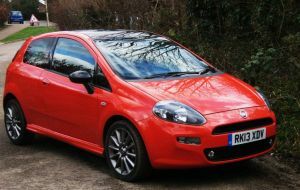 Enter this Sporting version of the Punto that scores strongly when it comes to the so-called street creditability factors, the test car being painted in a cost extra bright orange with a black roof and boasting a rear spoiler, side skirts, chrome exhaust tailpipes and eye-catching black alloy wheels. Inside the interior is customised by the use of a ‘Tarmac’ black finished facia, black roof lining, sport leather covered gear knob, trip computer and rear privacy glass. Mechanically it is an interesting package, the special Sports suspension system adding a bit more zest to the handling over the basic car while the 1.4-litre petrol-fuelled MultiAir engine pushes out a free-revving 104 bhp to justify the car’s overall image. Ride quality over varying road conditions remained comfortable with good bump suppression. A snappy changing 6-speed manual gearbox ensures that there is lively performance that can be enthusiastically exploited in a safe and secure manner while still retaining a good degree of docility for those seeking an easier way of life. The latter will also appreciate the dual drive electrically powered steering system that can be switched from the more positive high geared action to a softer lower geared action that can be used when manoeuvring in car parks and other tight parking situations. Driver vision is fine, with good lighting and windscreen wiper coverage though there is a slight blind spot at the rear-quarter rear angle and, dependent on steering wheel adjustment, some drivers might find instrumentation is partially obscured by the steering wheel rim. Strong braking power and a ‘with it’ driving position, despite the seat cushion feeling a bit on the short side, ensure that the performance potential of a claimed 115 mph and 0 to 62 mph (100 kph) acceleration in 10.8 seconds can be enjoyed even over long sessions behind the wheel. Noise? Of course there is a bit as one would expect from any Italian car but just sufficient to be appreciated rather than grounds for complaint. Bearing in mind that this is a performance version, the economy factor, aided by a Stop+Start system is not the most frugal in the range but the combined official consumption figure of 49.6 mpg should see at least 40 mpg under general driving conditions though fuel emissions at 133 g/km means there is some road tax to pay. luggage capacity, child seat preparation, powered front windows, air conditioning, a good audio system, an airbag system that includes the usual front ones plus curtain bags and one to protect the driver’s knees. There is an auxiliary power point planted close alongside the handbrake lever that meant every time I used the handbrake it knocked out the connection for my portable satellite navigation unit – when a facelift is due it would be useful for a bit of re-plan. The black alloy wheels look the business but there are only four of them with a repair kit/inflator provided in the event of a puncture. Experience with this Punto, my previous tests of the 500 range and a recent hiring of the latest Panda 5-door hatch back, convinces me that Fiat is very much up to speed when it comes to advanced environmental engineering, safety and practicality in compact sized cars. What’s more, for looks, they all retain the popular Fiat character. MAIN RIVALS: MINI, Suzuki Swift, Citroen DS3 Sport. Price From: £13,355, as tested: £13,945. The biennial Paris Motor Show opens to the public Saturday 4 October, and runs through to the 10th with nearly 100 new and updated cars unveiled. It is the world’s oldest motor show in the world, started in 1898 by industry pioneer, Albert de Dion. These days it is every other year and held at the Paris Expo at Porte de Versailles easily reached by Metro. Whilst the show normally closes at 20:00 on the Thursday and Friday it will remain open until 22:00. Star of the show is likely to be the Jaguar XE compact saloon, full of innovations, which is announced today (8 September) and will surely in time become Jaguar’s biggest ever seller. The XE based on a completely new subassembly, the ‘iQ Al’ aluminium structure will also be used to underpin the forthcoming SUV from the brand due in 2016 and eventually find its way under a range of Jaguar models in the future. Whilst there will be a top of the range engine available, straight out of the F type, the great majority of sales will be with the equally new family of Ingenium four-cylinder engines with a claimed up to 75 mpg. Centring on an eight-inch touchscreen and featuring voice control, the Jaguar XE infotainment tech runs a number of built-in features, and also allows iOS and Android smartphone users to access apps via the in-car display. On top of this, Jag’s InControl Remote means smartphone users can control a number of functions – like the door locks, climate control and ignition – from wherever they are. Once back inside, the XE can double as a wi-fi hotspot as well, with the vehicle antenna providing a strong enough signal for multiple devices. Working alongside the multimedia tech will apparently be a range of driver assist systems, including a laser head-up display that can project high-contrast colour images, such as speed and navigation details, onto the windscreen. Jaguar will have a major presence at the sell-out 2014 Goodwood Revival, with the Lightweight E-type making its European debut at the event, and the new F-type Project 7 also being presented in the Earls Court Motor Show exhibition. 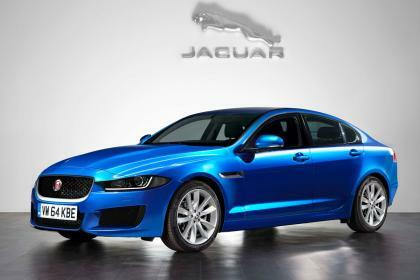 Will the XE be seen? Is Jaguar going to utterly steal the show? FORD has announced prices for the latest best-selling Focus, in dealerships from November, will start from £13,995; the same as today's Focus, with top Titanium and Titanium X versions costing £100 less than the current equivalents. The new Focus range retains a six-series line-up of Studio (from £13,995), Style (£16,795), Zetec (£18,295), Zetec S (£20,045), Titanium (£19,795) and Titanium X (£21,795). The advanced new Ford Focus builds on its reputation for technology, which since 2011 has featured automated parallel parking, ‘Active City Stop’ low-speed collision avoidance, ‘Traffic Sign Recognition’ to monitor and record road signs and ‘Blind Spot Information System’, all as optional equipment. The new Focus is the first Ford to offer ‘Perpendicular Parking’, an additional hands-free parking technology to help drivers reverse into spaces alongside other vehicles. The current Ford Focus debuted ‘Active Park Assist’ that, at the push of a button, uses ultrasonic sensors to locate parking spaces and steer the vehicle while the driver controls the accelerator and brake. The addition of new sensors to the rear enables Perpendicular Parking to operate in the same way.